What to Consider When Working or Training a Horse in a Double Bridle. The double bridle is a sophisticated tool and like any other complicated device has no place in the hands of a novice or beginner rider. One of the most common faults in novice riders is a lack of balance, followed closely by an inability to keep their hands still. Unbalanced riders often use the reins as a balancing aid, which results in the horse suffering a constant jolting pressure on its mouth. This is one way in which a horse becomes hard mouthed, and is the reason mouths like this are often seen in riding schools, where the horse is subjected daily to riders snatching at the reins to avoid toppling off. One of the main offenders of incorrect use of the double bridle is in the world of showing. In many show classes a double bridle is either recommended or perceived as so. The result is young riders on young horses with little or no understanding of the reason for the double bridle and little or no training in its use. This is linked to the quick fix method of schooling horses into an outline using training aids such as draw reins. both the double bridle and draw reins have their place in encouraging gymnastic improvement in the horse. Both require the horse to develop a more rounded and collected outline. Neither of them should be used for the sole purpose of getting the horse to bring its head down. The restraining and lowering effect of the curb rein will encourage your horse into the correct outline only if it is pushed up into the contact. 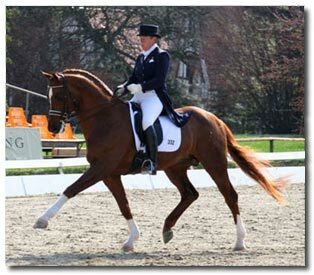 If the rein is held and no impulsion achieved the horse will simply become overbent and fall onto its forehand. 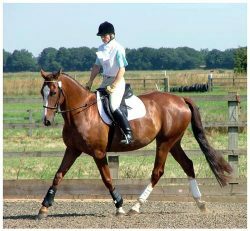 The horse should be ridden principally on the snaffle or bridoon rein, with the curb held in a light contact and only used gently when necessary. This is especially true in situations such as cross-country riding, where a strong checking force is only necessary immediately before the jump to steady the horse. Different ways of holding the reins to ride mainly on the snaffle. There are many different ways of holding the reins of the double bridle. The reins should be held in such a way that the snaffle is in a comfortable position in the hand to allow it primary use. The most widely recommended is to hold the snaffle rein between the third and little finger, and the curb outside the little finger. This way the snaffle rein is held above the curb, with the curb able to be held loosely and used very little. Other options are holding the snaffle rein between the second and third finger and the curb between the third and little finger. In an educated riders hands it makes little difference which double bridle rein is held where, as they should be able to be gentle and vary the contact as necessary with both reins. 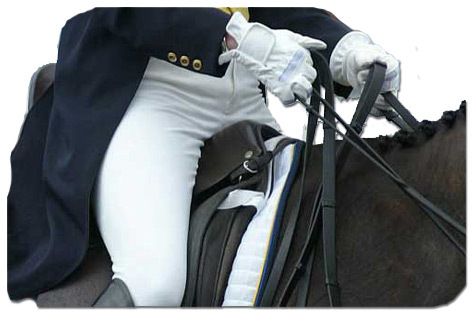 requires that the snaffle rein comes over the top of the fist and down through the hand, while the curb rein comes under the little finger and up through the hand. Avoid using martingales or other restraining devices with a double bridle. If the horse is established and sensitive enough to be working in a double bridle, other equipment should not be necessary. If a horse is exceptionally strong and you’re jumping cross-country or hunting, it is generally recommended that the martingale is put onto the curb rein and rein stops are used, as the martingale ring is slightly larger than the lower ring of the curb bit and can catch and slide up the bit, which is extremely dangerous. The double bridle should be introduced gradually, after established work has been completed in the snaffle. The horse should be allowed to become used to the weight and feel of two bits in its mouth before the rider asks anything of it. Your horse should be ridden for at least two weeks in a double prior to any competition, preferably longer. It should never be put onto the horse on the day of a show, as the rider will have no idea how the horse is likely to react, and the results can be and have been disastrous. Consider all your horse bridle and bitting options and make sure you choose the correct type, size and combination for the sort of work you want your horse to do.